OPINION Now that [Carisbrook] is no longer required, its owner – the Dunedin City Council – is looking to offer the site for a suitable redevelopment. As part of the exercise, council is making clear to interested parties that a few of the last remnants of the historic grounds’ past ought to be retained for incorporation into future developments. 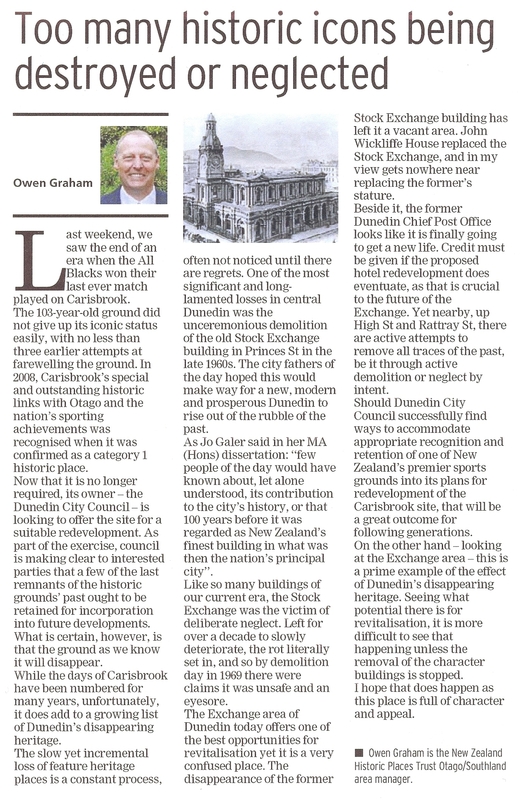 The Exchange area of Dunedin today offers one of the best opportunities for revitalisation yet it is a very confused place . . . nearby, up High St and Rattray St, there are active attempts to remove all traces of the past, be it through active demolition or neglect by intent.